It was a cool, overcast afternoon in Brooklyn and the crew had been up hours earlier preparing the set at Studio 959 for our special guest. And so he arrived, layered in various garments that tell a story about the places from which they came. 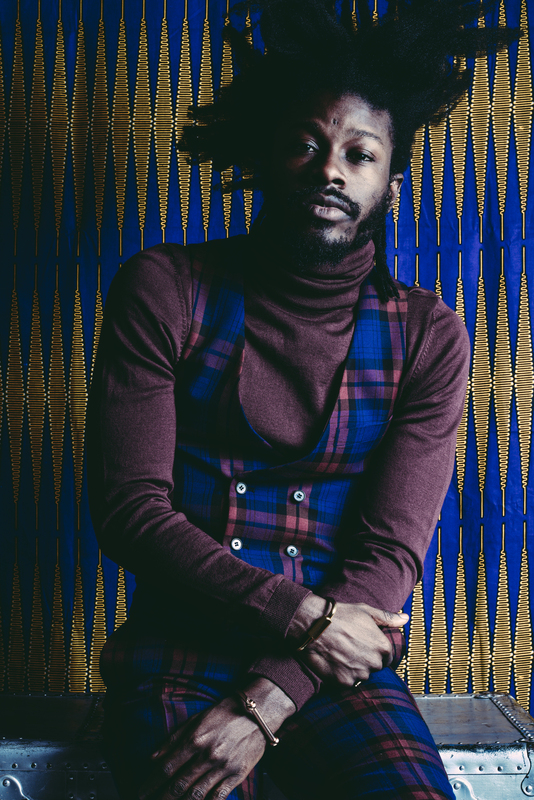 A radiant smile greeted us all as we shook hands with the poetic nomad and world soul crooner himself, Jesse Boykins III. Jesse's warm disposition set the tone for an enjoyable yet insightful dialogue on topics ranging from his upbringing in Jamaica to what he's learned about himself through his relationships with women. In addition to our lively discussion with JB3, we were given the privilege of styling him in some of our favorite looks for the Spring/Summer season. Never the one to compromise for the sake of "fashion," Jesse effortlessly embeds his personal style and character into every outfit. At the end of our day with Jesse we are left with one adjective to describe our experience...Schwaza! You'll understand what we mean by checking out the editorial interview below. 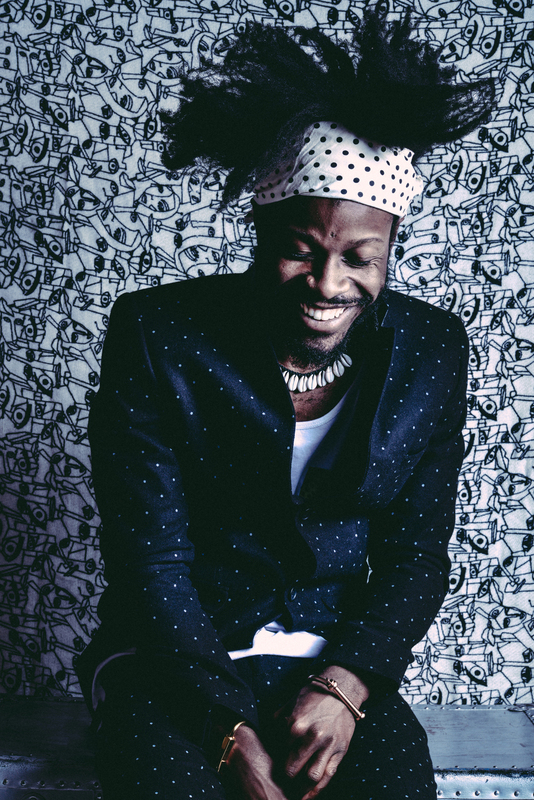 Who is Jesse Boykins III? I'll start by saying that I'm a creative. I like to come up with idea, made by music, design or lifestyle and try to apply what I envision in my mind to this dimension; the physical world. What made you decide to pursue a career as a musician? How did that come about? I feel like, It wasn’t really a choice. I was more so groomed to be a musician because most of my family is musically inclined. All of my aunts and uncles in Jamaica sang so I was influenced by them. I had always wanted to be a part of a family and feel in tune with who was around me. So, early on I made music to strengthen the bond with my family but as I got older I developed my own passion for music. Moving to Miami and having to be myself was one of those things that kept me grounded during that transition. Although I experienced a bit of a culture shock in moving to America at a young age, I became super intrigued by music, sports and film over time. How did your family, specifically, help shape you into man you’ve become thus far? I learned a lot from my aunt and uncles seeing that I didn’t live with my mother and father until I was about 7 or 8 years old. My uncles in Jamaica let me do whatever I want. Say if I wanted to climb a tree and if I ended up falling they would tell me the correct way to do it by paying attention to certain details. It was their way of teaching me life lessons. And my aunts really instilled in me qualities like obedience, punctuality and an increased awareness to being compassionate to other people around me. What would you say is your biggest obstacle? I would probably say myself. My brain is always ticking so I constantly have all these concepts. They can scale from really simple ideas to these grand things that will take about six or seven years to do. So, I guess I confront myself with my own obstacles then I try to figure it out the best way that I can. I learn through trial and error so that no one can come to me and tell me I can’t do something because I'll probably just figure it out anyway. Are there specific concepts that you think about? For example, as you go about recording a conceptual album. Of course I can write the songs and I can sit down and try to get the production together but everything is a step by step process. Once you get the sound, you think of the visuals and what they're going to be like. Then you think of the artwork, marketing, understanding your target audience and demographic. When you're performing the songs live, what's the stage show going to be like including the instrumentation for the band. The styling for what you were going to wear for the period of time the record is out. These are all things I consider when creating a body of work. Earlier you mentioned family as some of your influences, but who else would you say has inspired you in terms of music? I mean there are a lot of people. I'm heavily influenced by Bob Marley and kats like Andre 3000. There are also guys like John Lennon and Phil Collins, who strived to be progressive in what they were doing all the while acknowledging those who came before them. I'm impressed by their ability to bridge the gap and bring things together. As far as visual artists are concerned, I'm a fan of Marcel Duchamp. In terms of writers, I like Walt Whitman and Langston Hughes. And as far as films go, Spike Lee, Spike Jones and Wes Anderson are individuals who champion innovation, all the while connecting to what’s going on in the present. How would you say you fall in those categories? Well, I'm super progressive in what I'm doing. I don't think I've ever wanted to sound like anyone or make music that caters to what's trendy at the time. What I create is indicative of how I'm feeling and what I'm being exposed to during that time in my life. In the past couple of years, I've been doing a lot of traveling. I've toured for about four or five years in Europe, South Africa, Toyko and Russia. Those experiences have helped me learn a lot about different cultures especially from my friends who live abroad. That exposure has changed me in more ways than one. I know you pride yourself in your songwriting ability. Can you perhaps explain that process? It's a subconscious thing. When I first started out, it was something that I had to practice and I still practice now. But seeing that I've practiced it for such a long period of time, it's really like another muscle that is strengthened through exercise. I feel comfortable expressing myself in word and in song more than anything. Therefore, the process for me is just speaking my truth. When I'm writing a song, the lyrics are what they are. That’s my experience. I find that when I write in that form, there is more longevity to the song. It's timeless. There are going to be some things you might not understand initially, but if you listen to them frequently and live life, there might be something there that you can reference sooner or later. I find that the most powerful music is like that. You have to listen to an album 10, 20, 30, 40, 50 times to actually get one message that you probably would not have gotten if you didn’t live life while you were listening to that album. It's the connection between the two worlds. I always take that into consideration when I’m making music. I never settle nor do I compromise what I’m writing just to make the mainstream feel "okay" with my lyrics. That's not what I’m about! I do keep it in mind, of course, but it's not my priority when I'm creating. My priority is to create something that will actually cause impact. It may not impact you now but if you sit with it long enough, it will get to you. You're praised for your live performances. What is it about performing your songs in front of an audience that motivates you to make it an experience for those in attendance? I feel like when I'm performing and people come to my shows, I feel a sense of obligation to reciprocate the love they show in even liking my music. You listen to my music and you told me you liked it via online media or you might have sent me an email, but in person we can share this moment of appreciation together. In those moments I like to give 150,000% of my efforts. I want to make it as memorable as I possibly can. I don’t want anyone to ever forget if they ever see me live! Someone who saw me perform live from three years ago approached me and said, “Man I was in Paris with a girl and she told me go to your show, and I'm from Brooklyn. That was three years ago and now anytime you in any city that I'm in, I'm trynna see you." It's instances like that, that push me to show gratitude for the fact that people come to a venue to acknowledge my art. It takes a great deal of stamina to put on a show in a manner that you do. Do you have a specific fitness routine? I definitely stay active out here! It’s very important to have the ability to control your energy day to day and know where your energy level is, instead of just getting up to complete errands and after you do the first thing on your list you're already tired. I don’t like feeling like that so I work out pretty much every morning, four times a week. And I focus on my core because that's the center of your body, where breathing occurs. So I do a lot of ab and oblique workouts, cardio and yoga. I also do a lot of snacking throughout the day. People thinking having a big meal is good but then you have a lot of digesting to do which can slow you down. I like having a good breakfast like oats, granola, eggs, and for the rest of the day I eat a bunch of fruits, cashews or a small meal. Let’s talk about your style now. It is very unique and telling of who you are. What defines your look? I pay attention to aesthetic a lot but I also pay attention to freedom in aesthetic. To explain it would probably be like, let’s say, I go thrifting in Berlin and I find a tunic then I go to Latvia and find a leather vest. When I'm in New York, I pick up this fabric and get some pants made to pair everything together. The fact that it took all of that as opposed to me just going to one place and saying 'alright cool, let me get this outfit.' To me, I'm wearing the journey and that's what I feel like style is. You're supposed to express what your journey is like. That's what I try to do when I get dressed and put clothes. It's all the things I can connect with to make me feel more like myself. I see that you've worked with Liebeskind to design a multifunctional unisex bag. Is design, particularly in regards to menswear, something that you'd want to explore in a greater way? I’m a fan of the concept of design and style. I feel like, just like anything else that I create or I think of, I always try to make something that people will gravitate towards. For instance, if I’m designing a shoe, my main goal is to translate an idea. You see, I like dress shoes but some dudes only wear sneakers. So how do I make something that’s a dress shoe but feels like a sneaker. It would be about fusing the style of dress shoe with the comfortability of a sneaker to broaden the aesthetic of the sneakerhead. How do you balance the desires of a brand with what Jesse actually likes? How do you stay true to yourself? I'm fan of culture. It would be different if I were saying everything I do is original or has never been done before. No. The innovation that comes about when you’re an artist is the fact that you can take your inspirations and your influences and turn it up to another level. You can say “that’s cool, and I like that but I think if we did that, with this, this, and this, Oh [expletive]!" That’s my thing about being progressive. I don’t ever think or feel like I'm in a position where I'm going to settle and let a brand direct me aesthetically with anything that I'm doing because I am actually living what I'm doing and you would like to be a part of my life. If you look at it like that then you will always know that you are in control to some degree. Some people however want to rush in doing a lot of things and don’t necessarily have the time or think they don't have time to sit down, process, and plan for months ahead and be okay with that plan. It takes all those to be looked at by brands and make them want to work with you. So basically you’re like the authority. Exactly! But I wouldn’t even call it authority. I would say acknowledge your worth. Know your power. I wanted to touch on your lyrical content again but now in terms of subject matter. I see that relationships are a reoccurring theme in your songwriting. What would say is the most important quality or lesson that you've learned from a woman or women in general? I’ve learned a lot of things from women. I think as far as relationships go, the man thing I learned is to be myself. I feel like a lot of men cater to woman’s wants instantly and give them that instance. And I don’t think it’s entirely about that. I think it’s about progressing and getting to know someone over time. The best way to do that is by being yourself in a relationship and being open about your likes and dislikes. To me, the purest romance is when you actually become a girl’s friend; where you genuinely desire to see one another grow. That involves a great deal of honesty and a willingness to push that person to become a greater version of who they are at present. What do you want the masses to take away from your artistry? I think about that actually; in terms of the long-term impact my music will have on others. More than anything, I want people to know that I was real. And that my life as an artist wasn't the result of an image that I came up with in my mind which moved me to act a certain way to gain attention. There are so many instances in music and in any form of art where the gimmick behind things is propelled more than the actual art. I would like people to connect with the realism in my surrealism. So, that the things that I'm able to I create would actually improve and help the real world. To encourage individuals to be progressive in life and find the ability to love themselves in order to spread that love to others.